If you asked several people what they would describe as destructive behavior in dogs, you would get conflicting answers. The key to understanding dogs is to look at their natural behaviors and then to figure out what reactionary behaviors they may have developed along the way. As in most things in life, there is a cause and effect relationship between what a dog perceives and what a dog does. Most of the time, there is a very logical explanation as to why a dog has done what he or she has done. The dog owner who knows how to decipher the puzzle is the one who will have the most success in avoiding canine destructive behaviors. Let's look first at a few of the most common destructive behaviors. Howling or barking for a dog is like speech for a human. 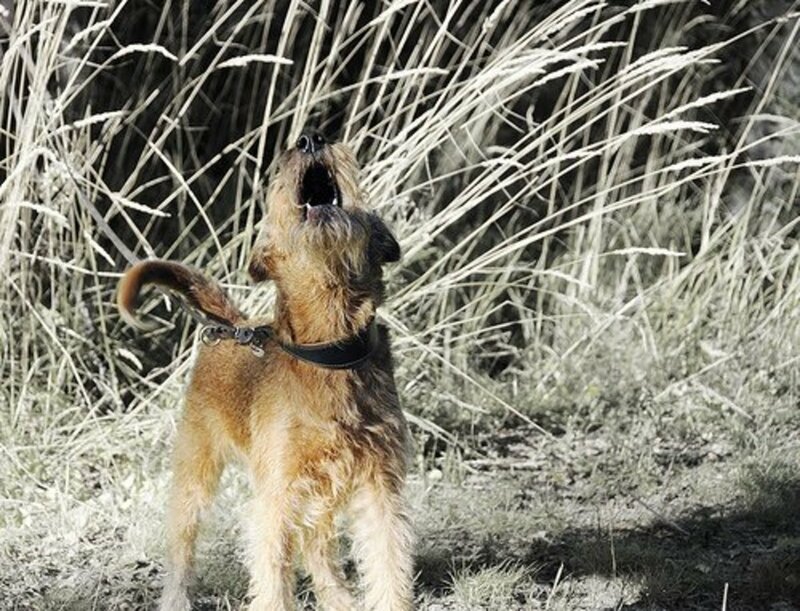 When dogs bark, they're trying to communicate "something." Whether that something is a warning--hey, there's someone behind the fence--or a plea for attention--hey, it's time to eat!--it's important to realize why the dog is barking or making vocalizations. When vocalizations become inappropriate or destructive in nature, that's where the problem arises. If a dog is left alone in a yard all day long with nothing to do, he or she may become overly bored and decide to bark at anything. Dogs that are teased by children or bothered by excessive noise around them can become incessant barkers. The pattern, once established, can be a hard one to break. The important thing to remember with dogs barking apparently needlessly or excessively is that they have learned this behavior somehow as a coping mechanism. Finding the trigger or reason is essential if you want to modify the behavior. Is the dog feeling like his environment is too chaotic, too noisy, too stimulating? Is someone or something inciting the barking or howling? For instance, if cats are sitting on the fence "teasing" the dog all day long the dog's going to bark! Someone needs to remedy the situation by removing the cats! Or if kids are throwing things at the dog over the fence or antagonizing the dog by making howling noises, the kids need to stop their behavior! Is the dog afraid of environmental factors such as thunder or hail? Some dogs bark instead of trying to get away when they're frightened. 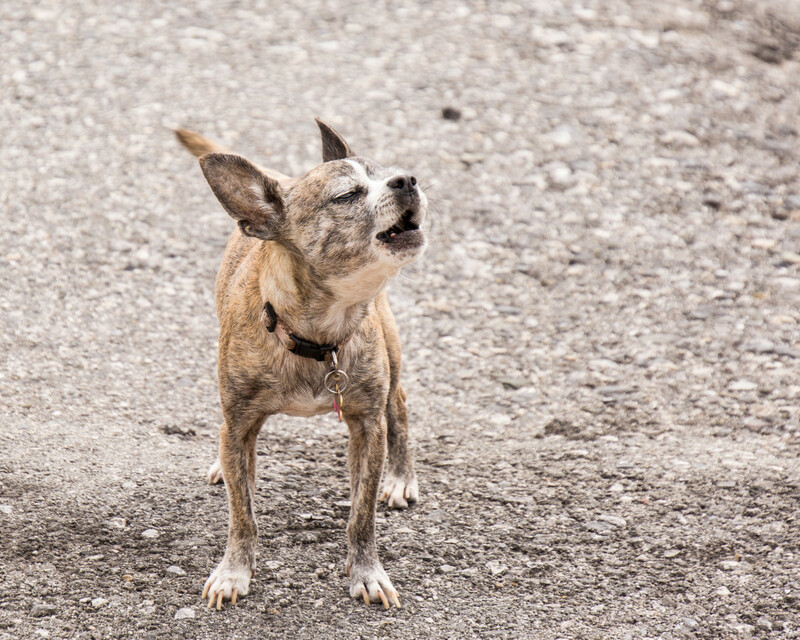 Take the time to analyze when and why your dog is barking before assuming that it's just your dog's personality (or fault). Dogs usually bark for some reason. You have to figure out the antagonist before you can remedy the problem. If you leave your dog or dogs alone all day while you're at work, you should not be surprised if destructive behaviors are the end result. That may seem harsh, but few humans like being left alone all day long without human contact so why would we expect our dogs to survive this practice unscathed? Dogs are social animals and some breeds even more so than others. Leaving a dog to his or her own resources for 8-10 or so hours a day is going to most likely have some repercussions. Especially if you leave your dog in a confined space--or heaven forbid in a kennel for that length of time. I know someone with a small dog who left the dog in a kennel while she was at work all day long. She came home to let the dog out for potty breaks and back into the kennel she went. The dog, years later I might add, still has anxiety issues and is an extremely demanding dog. I can't say that I blame the dog--I blame the owner. Dogs are meant to be free to the extent that they have full use of their muscles. Traveling in a crate is a good thing--it's smart and it's safe. Being in a kennel for a short period of time for a time-out is smart--it's a disciplinary tool that works. Being in a kennel to protect a dog from himself or herself when a puppy is a good idea if you can't be right there paying attention. However, leaving a dog of any age or any size in a small crate or kennel all day long is in this author's eyes animal cruelty. It's better than the dog being dead, yes--but the long lasting side effects from this kind of life are overwhelming for most dogs. I can honestly say from my years of observing other people and their dogs that as much as there are not enough dog owners for all the dogs in the world, I think it's even worse to see someone with a dog who doesn't know how to care for it properly. Just like children--if you don't have the time or the energy to care for them properly--don't get them! 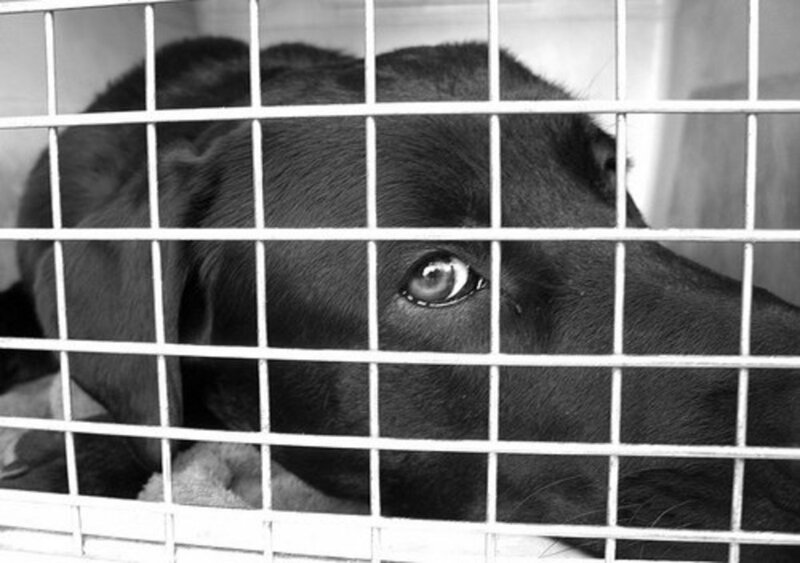 Being busy is not a good excuse for neglecting a dog by sticking it into a kennel. Even large outdoor kennels unless they allow running room are like doggie prisons. Without regular muscle stimulating exercise, dogs' muscles deteriorate and atrophy. They gain weight, can become ill and much more importantly, can become mentally unstable. Again, I believe in confining a dog in appropriate situations--but the key word here is appropriate--not convenient for the owner as a babysitting tool. When folks term chewing as destructive behavior, it's important to define what is meant in the individual situation before terming this a negative behavior. 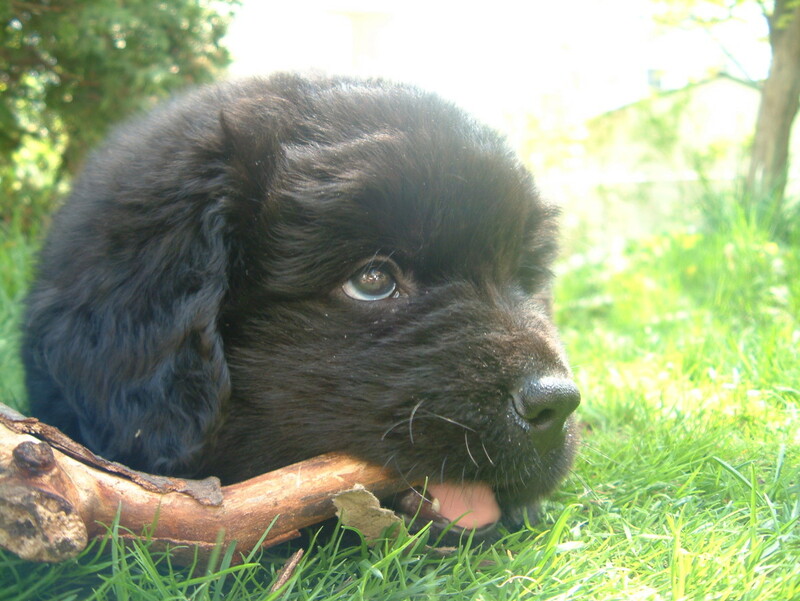 For instance, when a dog is a puppy, he or she has to chew. There is no way around it. If you don't want a dog who has to chew, you should never get a puppy! Chewing is a dog's way of exploring the world around them. When dogs are puppies, they chew because they're cutting teeth and much as children do, they need something to make their gums feel better. 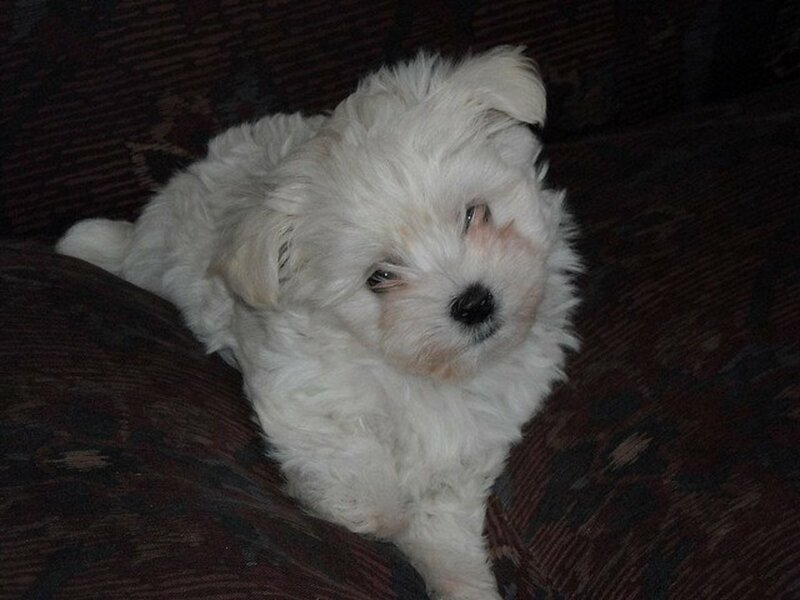 Punishing a puppy for chewing is like punishing him or her for breathing. When dogs mature, sometimes the chewing behavior stops completely by around age two never to be seen again. However, other dogs may have continued the behavior as a form of releasing anxiety. Some dogs in fact never stop chewing--sad but true. This author had one dog who until the day he died at ten would chew certain objects if left in his area of reach--like remote controls. For whatever reason, he had a remote control fetish and he never quit chewing them up. The key again is to understanding why the dog is chewing. Furniture can be a tempting surface because it has wood or it has stuffing--or it smells a certain way--for instance down pillows. One of my dogs has a fetish about the smell of the pillow and if left alone with one, will chew the ends off and pull out the feathers. Chewing on plants and things in the yard may not seem like a big deal but they can have grave consequences--as in killing your dog. 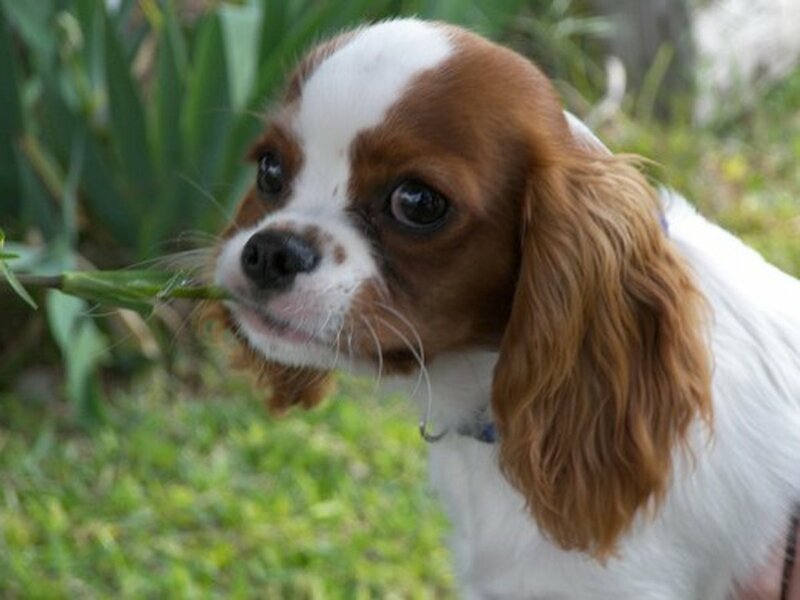 Certain plants are poisonous and allowing dogs to chew on them may result in a tragedy. Even chewing on fabrics--like clothing, shoes, curtains, plastic chairs, etc. can all lead to disastrous results in terms of your dog's health. Pieces of unnatural fiber or even natural fiber can tangle in dogs' intestines and require surgery. Rocks or foreign objects can lodge in the dog's throat and cause them to choke to death--or pass into the stomach or intestine and need to be surgically removed. What's the solution? The most intelligent solution is to make sure your dog is observable when he or she is chewing on anything. That includes rawhide (not recommended by this author), bones, antlers and toys. Anything that has the potential of hurting your dog should be given to them under supervision. Give them appropriate toys to play with--things that they can't destroy such as Kongs or balls that can't be chewed apart. A great adjunct to a Kong is putting a treat such as a raw carrot inside and letting the dog chew and chew until he or she gets it. Much like children, dogs do become bored with the same old thing. Buy new toys periodically and put the older ones away--but cycle them all so the dog always has something new to chew on now and again. Ditch things that are past their prime or have loose parts--especially squeakers. Remember the rule when you're raising a puppy--as soon as you see him or her chewing on something you don't want them chewing on, replace it with something else. Avoid scolding and punishment as if it's chewed already, it's done. Reinforcement is usually the end result when we yell or punish rather than just redirecting the behavior. Why do dogs dig? For the same reason that they bark--it's part of their behavior pattern and it's fun! Most dog owners don't like their dogs digging, however, and in fact, it can be a dangerous behavior especially if it leads to getting at something that could be harmful to them or worse yet, escape. 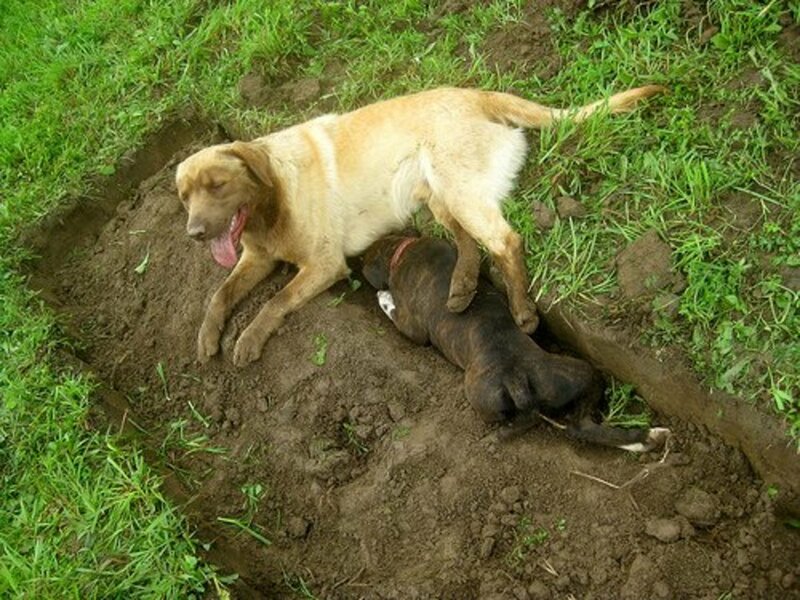 Some dog breeds are more proficient at digging (and escape) than others. No matter what the breed though, the important question to ask yourself if you have a digger is why is he or she digging. Believe it or not, that is a vital part of the puzzle. For instance, since I have malamutes, part of our yard involves a layer of brick underneath our fence. That is the best deterrent we have found for keeping our dogs from digging out under the fence and getting loose in a dangerous environment--wildlife, snakes, livestock and guns. Since northern breeds have a propensity to digging out and escape, it is the logical solution and has never been a problem. Does this stop them from digging completely? Not entirely--because we live in a hot climate and oftentimes our dogs will dig a hole wherever they find a spot to create a cool spot to lay in. So is that technically destructive behavior? No way! It's smart behavior because the dog is actually trying to cool off and going about it the only way he or she knows how. The solution? Provide an alternative--a nice shady spot that's cool or even a spot where water's sprayed to keep it cool. In extreme cases, a cooling mat is not out of the question to give dogs respite from hot weather--and a reason not to dig. We leave out a wading pool filled with clean water which allows the dogs to cool off when they need to. Does it totally eliminate cool holes? Not entirely but it does cut down on them considerably. Another solution is to give dogs a spot where they can dig--with your blessing. Leave it devoid of anything except dirt--and bury toys or treats and encourage the dog to dig there. For dogs who are left alone to their own devices, digging can sometimes be an outlet. It can of course also be a source of escape. If your dog is alone in the yard all day long and digging is an issue, consider giving toys as mentioned above (perhaps enticed with a treat inside) that keep the dog engaged in something else. Of course the best solution is to make sure the dog has interaction and the behavior will probably not even be an issue. If digging is an issue though, figure out why and when the dog is digging and then take steps to mediate the problem by actively working to solve it rather than blaming the dog. He or she is just doing what dogs do naturally but we as humans can come up with alternatives. Perhaps the most frustrating (and dangerous) destructive behaviors in dogs center around aggression. Whether it's aggression towards humans or aggression towards other animals, it's very hard to ignore and definitely detrimental to any dog's well being. Often the most overlooked part of this kind of dog behavior is an explanation for the behavior in the first place. Most dog owners or victims assume that the dog "is just like that" which is usually far from the truth. In almost all cases, there is a reason for a dog's aggression. 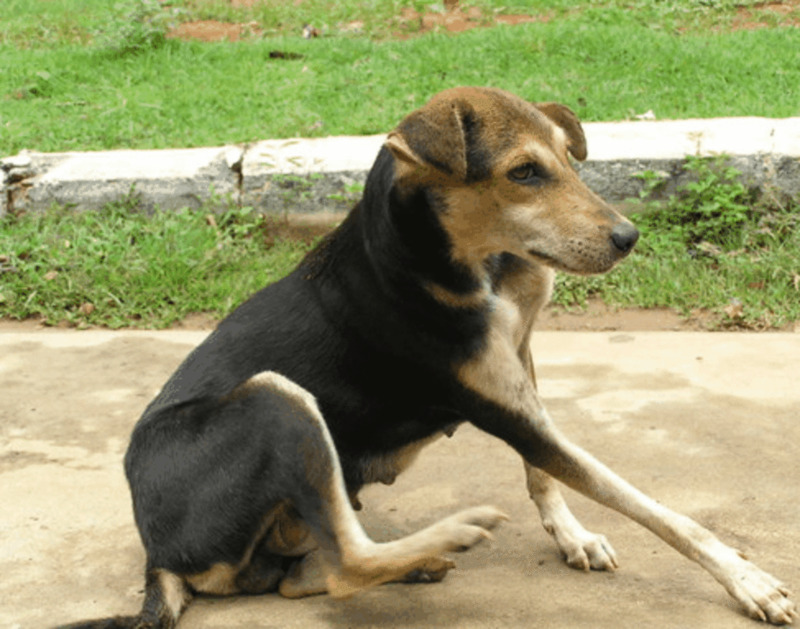 While it is not necessarily a pleasant realization as to why the dog reacted the way he or she did, there is most probably a definite link to the behavior. On any given day, any dog can be aggressive--to anyone or anything. Why? Because they're dogs! They don't have reasoning abilities like humans and they simply react. So a seemingly well behaved family dog can bite a child without warning simply because the toddler grabbed the dog and frightened it. Was that a destructive behavior? This author says emphatically no--it was stupid behavior on the part of the dog owner for allowing it to happen. I'm a firm believer in dogs not getting into trouble if their owner does not put them into a situation where they can fail. Knowing your dog but especially knowing your dog's breed are really key parts of the equation. 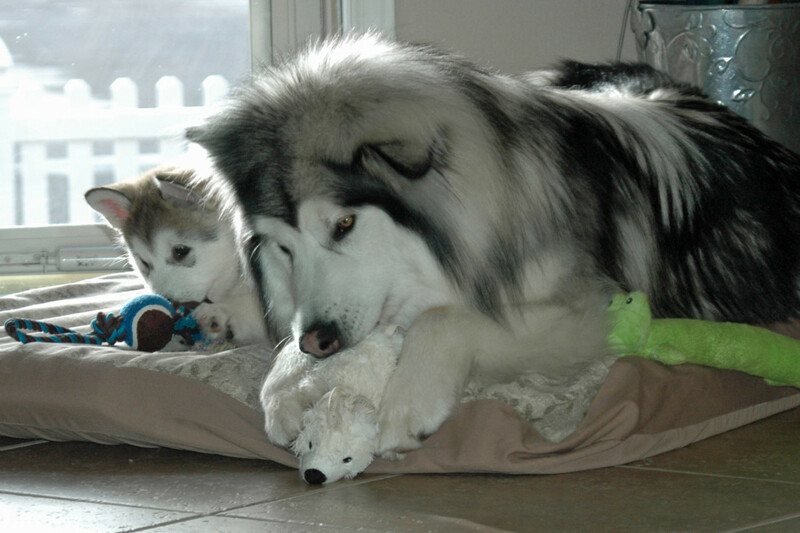 Some dogs for instance have more of a prey instinct than other dogs--malamutes tend to react to small animals like cats whereas other dogs might not even notice them. Consequently, when walking my dogs and seeing a cat, I make sure my dog is under control lest there be a lapse in my dog's concentration where he or she decides that cat looked like food. Simply because of the size of my dog's teeth, I do not tolerate food being an issue. This is not to say I can control every situation, however, one of my dogs is a rescue dog who was starved. I will not let children be around my dog when they're eating--nor will I let children be around my dogs if the children have food. In my humble opinion, sometimes disasters could be avoided if people stopped and thought about their expectations from their pets. While my neighbor's toddler might be able to run up to my dog and throw his arms around my 90 pound dog's neck and be quite safe, I would not allow that to occur without my being present--nor would I allow it to happen if the child had a cookie in his hand. It just doesn't make sense. Destructive or aggressive behaviors towards other animals or people in dogs usually stem from some trigger. Rarely does a dog just "go off" and become aggressive--unless they have been abused in some way. However, the key to stopping aggression in dogs is to ward it off before it has a chance to happen. Figuring out your dog's personality and knowing what things seem to annoy or frighten him or her is really important and then working on those things to desensitize him or her. Sometimes though, as in the case of my rescue dog and food, it's the dog owner's responsibility to just not put the dog in any situation that could result in misbehavior. 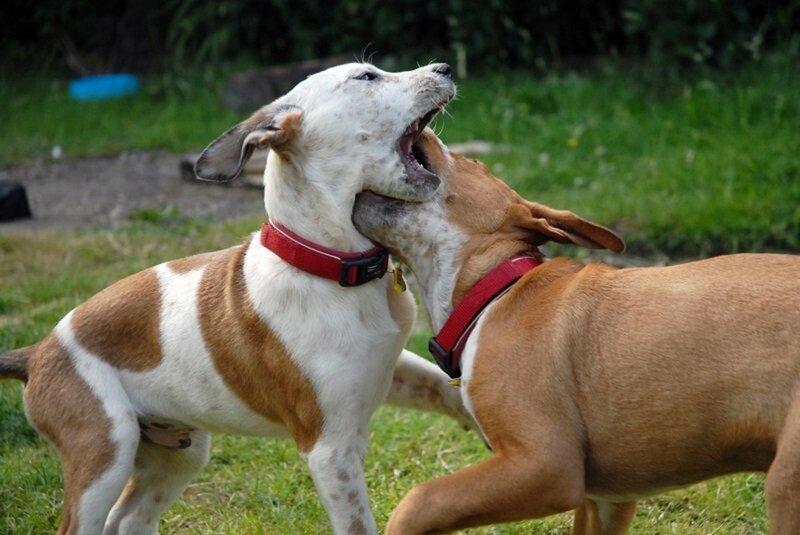 Likewise, if a dog demonstrates aggression towards other dogs, it's important to know this and not put the dog into situations where he or she feels threatened. I've personally observed many dog owners who seem to think dogs are people too. While this is not a bad sentiment, it is far from the truth. Taking dogs who have anxiety issues into large groups of people and expecting the dog to "behave" is not realistic. 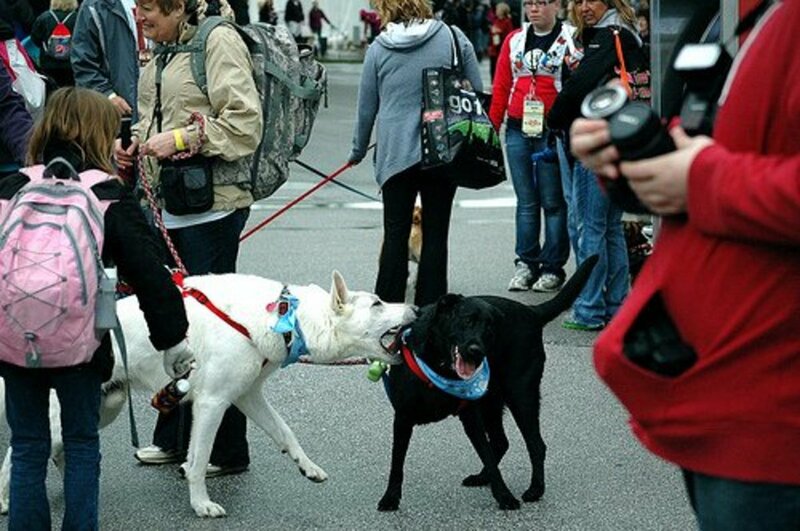 As the photo shows, bad things can happen when dogs react. Sometimes innocent bystanders can get caught in the crossfire as well, like children. Dogs depend upon their owners to make the calls in social situations. When we set our expectations above what our dogs can actually do, we all fail. Not to be taken lightly, as the picture below illustrations, fear or phobias can be an incredible trigger for dogs. An otherwise calm, cool and collected dog who has a problem with thunder for instance, can and will do anything and everything to escape. 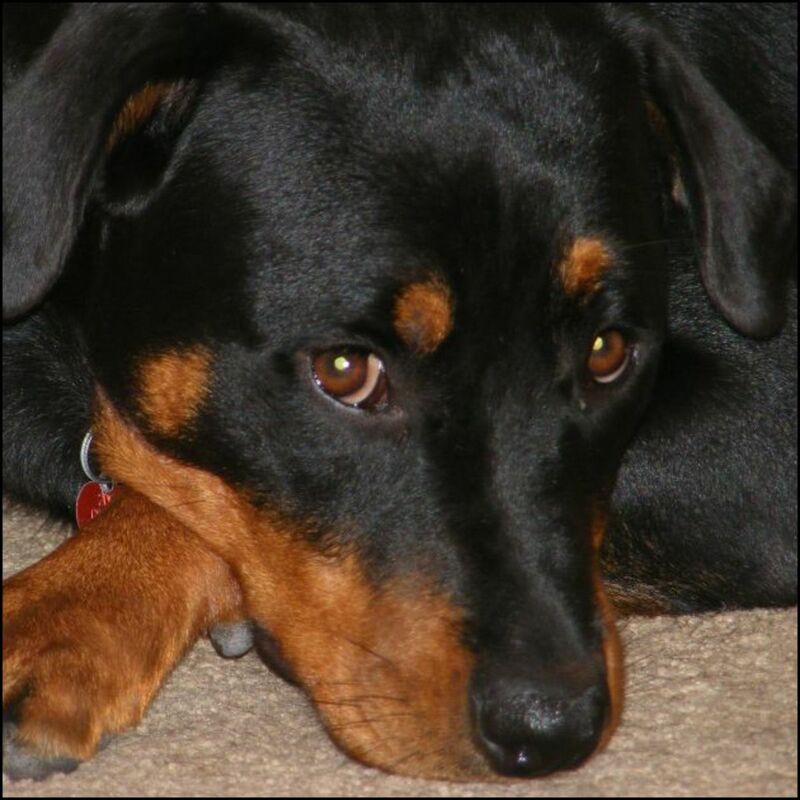 Oftentimes owners don't realize the effect of anxiety on their dogs until it's too late. 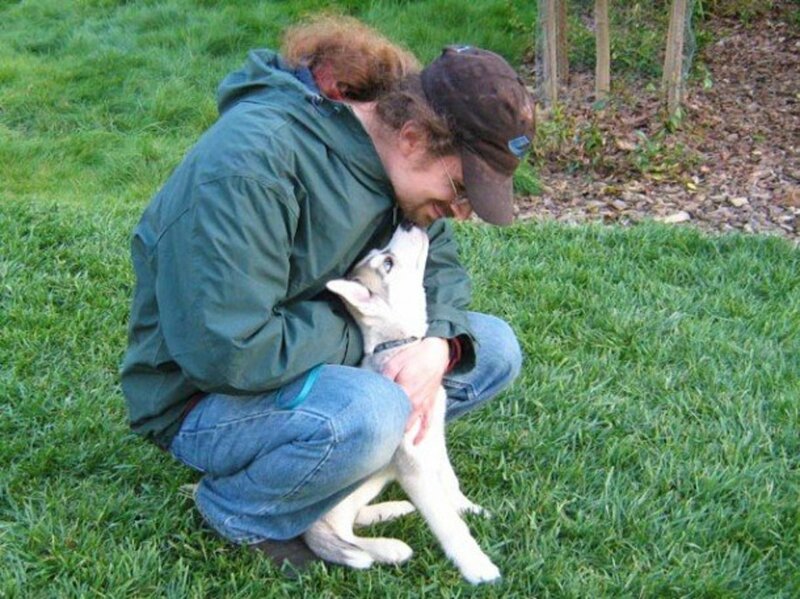 For instance, our rescued malamute was apparently loose in very bad electrical storms before she was found. 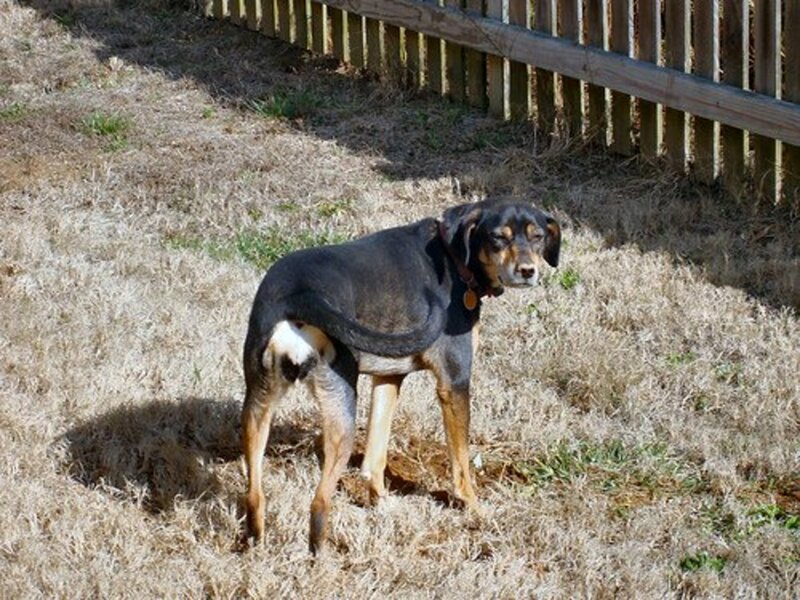 Emaciated, starving and near death, she's never forgotten her fear. During a freak storm on a summer day in our Central Oregon area, we were away from home when we realized she was still in the backyard. As we raced home to get her into the house before the storm grew worse, she had already taken matters into her own hands. She jumped through a screened window in a downstairs window, landing on a sewing machine, knocking it and the table to the ground. While the damage was relatively minimal, it could have been a horrible disaster--especially had the window not been open. I for one am almost certain she would have tried jumping through the glass window to escape the sounds. We make sure that we're home during thunderstorms or that she is in a safe place in the house with lots of noise like the TV or fans going to reduce her anxiety. Medicating her was recommended but we found that that only made her worse. Tools like thundershirts, etc. have had minimal effect as it seems the true thing she needs most is just human reassurance and being in a safe place with people she trusts. Anxiety in humans is a very real thing. Consider the fact that dogs cannot reason so it must be twice as bad for them. 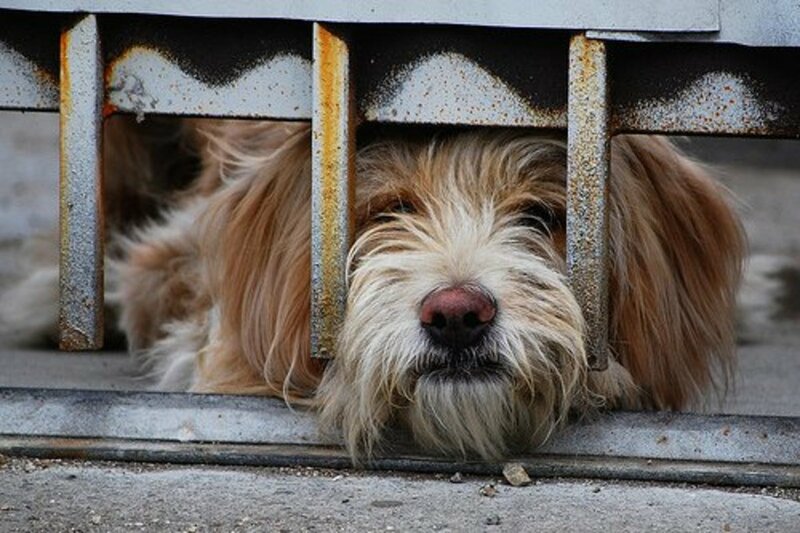 Their fear is real and dog owners need to be aware that the only logical way to deal with the resultant behaviors is to keep the dog out of these situations as much as possible. Noise can be a powerful trigger for aggressive behaviors but for some, being confined in a small space can have much the same effect. It's not unusual for a dog left in these situations to eat holes in the drywall or the door or completely tear the room to shreds trying to escape. 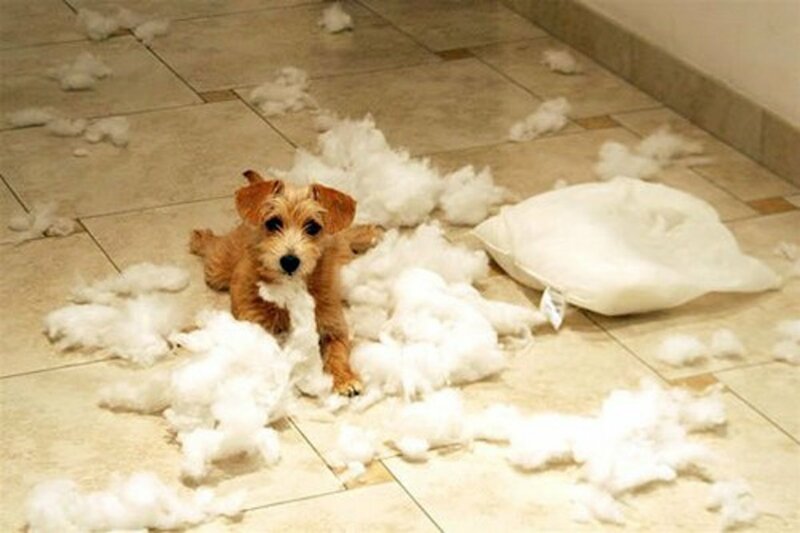 If a dog has destructive behaviors of any kind, the most important factor is to identify what they are and then to identify when they are occurring. The last step is providing an alternative to the destructive behavior. If dogs are bored, they will misbehave. This is a known fact. So the solution is not to let your dog be bored! If you have the luxury of being home, interact with your dog as often as you can. Get in the habit of always exercising your dog and you will have a happy (and healthier) companion. Again, if you have a dog or dogs and you can't make the time for them, you should not have them in the first place. Being busy is no excuse for ignoring your children or your pets. If you work outside the home, make time before or after work to exercise your dog. Give a thought to changing up the routine as well. Dogs get bored like people doing the same thing all the time. Go walking in different spots at different times of day. Enjoy your dog's exercise time yourself and you'll get more out of it. No matter what season, anyone can exercise their dog. 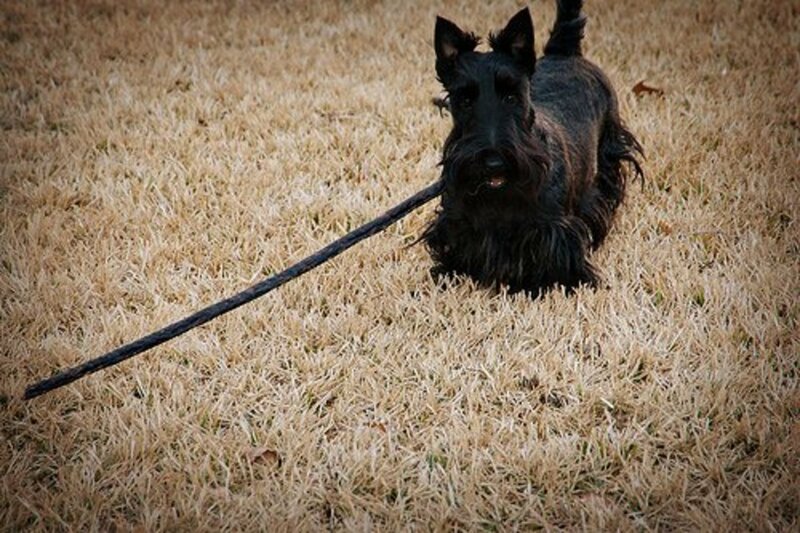 Engage your dog in a fun activity if that happens to interest you. 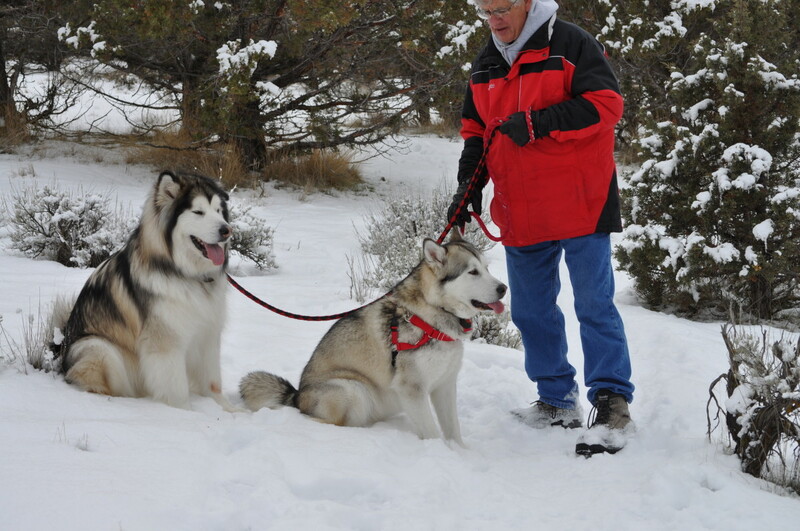 Some breeds like malamutes are great pullers so sledding is a great winter activity to help them release energy and feel successful. In summer, the same principles apply to scootering. At the very least, walking is something most everyone can do. Tiring your dog out goes a long way to avoidance of destructive behaviors! Dogs need human interaction and just taking a few minutes every day to have your dog chase a ball is worth every precious moment. Consider taking your dog with you on vacation. Some dogs travel surprisingly well and today, there are so many pet-friendly options it's incredible. Leaving large dogs in boarding facilities seems cruel and unusual punishment. If you can possibly arrange for a house sitter, especially for large dogs or dogs of certain breeds, that is preferable. Even facilities who claim to have large dog runs or allow exercise times rarely let dogs play for more than 15-20 minutes at a time. Without even being aware of it, dog owners can plant the seeds for anxiety in their dog by kenneling them for days or weeks at a time. Every dog this owner knows welcomes a romp on the beach--or even a swim in the lake or the stream. Adjusting your life around your dog's needs isn't a bad thing and especially one that grows on you if you take the time to get out and about with your dog--ideally from an early age. You don't have to be tied to your dog--but you can take him or her into consideration and be the better for it. This author is a sucker for dogs. I've rescued and raised them all my life and being a one-dog family has never actually ever crossed my mind. I've personally found that dogs are very social creatures and they love interacting with their human counterparts as much as possible. However, nothing can replace the camaraderie that they feel with their own kind. While occasionally having more than one dog can backfire on you (two dogs can obviously cause more damage than one dog), I've personally always found that having two (or three) instead of one is not that much more difficult. You definitely need more hands (and more of everything) but the benefits have far outweighed the downside. 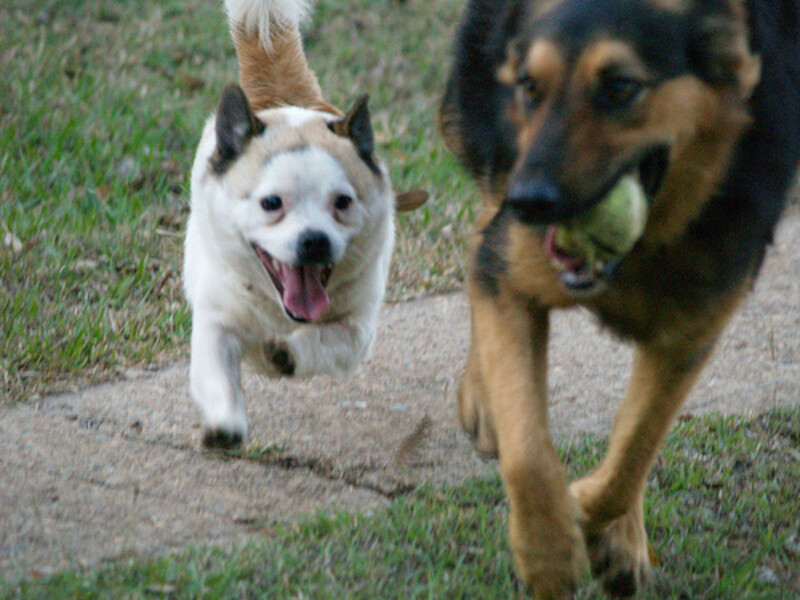 Having a playmate means your dog can interact at any time during the day with his own species. Especially with malamutes, who are overly social anyway, this is an added bonus. It teaches them all about pecking orders and respect. It also gives them a sense of purpose and knowing where they belong. Lastly, it teaches them about the give and take, the right and wrong of behaviors and the meaning of obedience. Folks who can't afford or physically handle an additional dog do have options as well. Setting up play dates for dogs is not unheard of and is a great way to build confidence in a lone dog. It's also a great way to burn off energy and all those negative temptations that might creep into his or her head because boredom is the problem. Going to dog parks works for a lot of dog owners and for a lot of breeds. However, this author is not keen on them at least for our type of dog and in our type of situation. I totally see the value of this though as a social outlet for most dogs. Mine unfortunately are of the breed that will finish something if another dog shows aggression towards him or her and unfortunately my experience has been that some dog owners bring dogs who should not be in the park at all. After mine have been bitten a couple of times while the owners looked blithely on, I decided it probably would be in my dogs' best interests to avoid them. Doggie daycare is another option. At least in this situation, you can count on the dogs to be socially adjusted and also have the supervision factor in place. Still another option is that if you can't walk your dog or exercise him or her regularly, you can find someone else to do it for you. Whatever works and whatever you can afford should be taken into consideration but again, if you expect a dog to be well behaved and not submit to destructive behaviors, appropriate care has to be given in preventing those behaviors. Destructive behaviors in dogs occur when there is a missing link somewhere. Something is wrong in the dog's mind that is causing the behavior to happen. 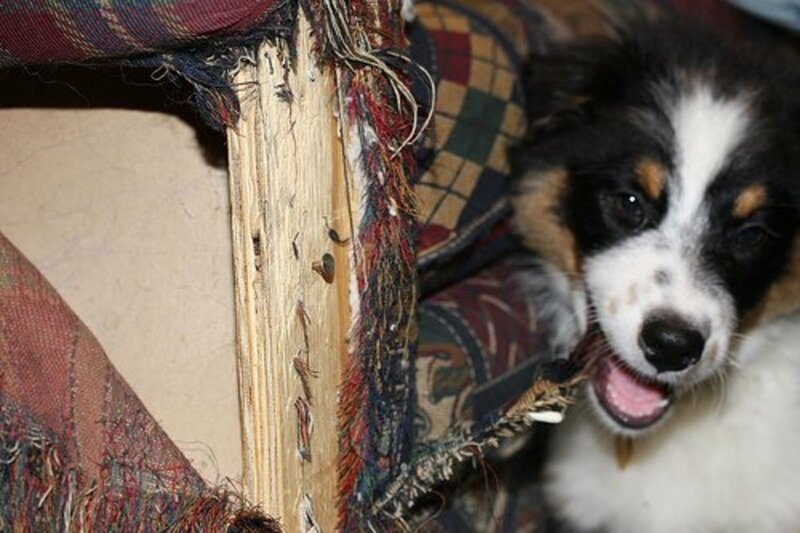 Again, puppy behaviors are not destructive behaviors--they are puppy behaviors. Know the difference and do not expect more from your dog than is possible. They have to pass through the puppy phase to get to normal dog behavior. If, however, your dog is exhibiting destructive behaviors after reaching adulthood, you need to look at the root cause and then take steps to fix what's wrong. Punishing destructive behaviors is the opposite of what a dog owner should do. Anyone who hits, kicks, or otherwise abuses a dog should not have a dog in the first place. Enlist the help of a qualified dog trainer if you cannot figure out how to deal with your dog's destructive behaviors or read up on what to do. Usually there are many recommendations in treating a dog behavior and you'll have to decide which one works for you and your dog. The important thing when faced with adversity with your dog's behavior is learning how to recognize signs before they happen and then actively correcting it through logical steps to prevent it in the future. It can be done but it does usually take effort and patience. Remember that every dog is only as "good" as his or her owner encourages them to be. Put your dog in a win-win situation and you all win! Is Your Dog Bullying Other Dogs? Please bear in mind that dogs eat plants to self-medicate. this is not destructive behaviour, but entirely sensible. of course caution is needed with certain toxic plants, but too many people control everything the dog puts into its body and then get cross when he forages for plants. Zoopharmacognosy is the study of animals self-medicating. Good for you, Flourish - what a kind thing to do! Great hub. Very thorough information. The poor pup next door tries to dig under the fence, and I am concerned because his choice of digging areas involves a buried utility cable. I have purchased him some toys and go to talk and play with him. I have also talked to the neighbors about engaging him a little more. Yes, he has a crate here, and he takes naps there, but I never put him in the crate to punish him. I want him to like the crate and think of it as a nice, peaceful place, nothing negative. He also has a doggie bed, and he loves it, but again, like with the crate, that's his place to rest and enjoy. I think he feels he has to watch the door, and he just can't relax. Thanks, RC--I'm passionate about dogs and their behaviors--I guess it must show. Sometimes I think the problem is we tend to think of dogs as people, which is cool--but we forget that they truly aren't. Understanding is the way to fixing most everything. Wow, I was not expecting such a comprehensive article! Great job with this topic. 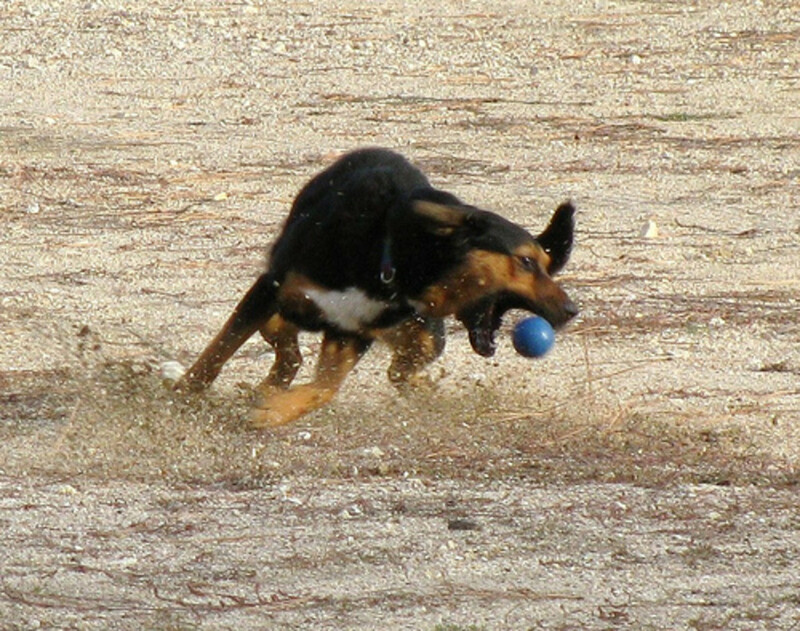 You have covered so many important aspects of destructive dog behavior. Thanks for the great resource. Hi Audrey, Hope things are well with you! Great hub packed full of information and insight about dog behaviour. One of my Rough Collies, Megan, from many years back, was a super dog but when fireworks were set off, especially around Guy Fawkes night it was a nightmare for her. We tried everything under the sun, but the only solution was to get temporary sedation from the vet. Not a pleasant thing to do, but it was either that or she was liable to have had a heart attack with the stress. So I could sympathise with your beautiful Malamute who was scared of the thunder storms - poor soul! But great hub + voted up! So s ex is out then?